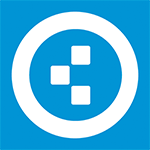 All those countless hours spent on your phone have been preparing you for this moment. 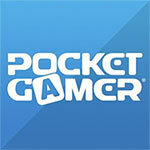 Fulfill your destiny and become… THE ULTIMATE PHONE DESTROYER! 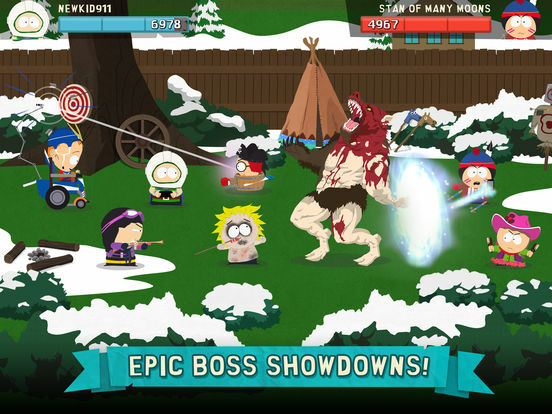 From South Park Digital Studios comes a real-time battle game like nothing you’ve ever experienced before! 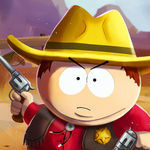 Take on Cartman, Kenny, Stan and Kyle in all out mobile mayhem! That goes for lapsed fans, too. I’m not sure what it says about me as a person, but hearing Ike say “I’ll cut you!” and “Don’t kick the pirate” when throwing him into the fray makes me chuckle. A lot. Phone Destroyer is simply so well-made that it makes you forget or overlook some of its pay-to-win DNA, and that’s no easy feat. Viva la New Kid. It’s very difficult for me to figure out who South Park: Phone Destroyer is for. It’s not a particularly great twist on Clash Royale, it has dubious monetization schemes in it, and it doesn’t really do much to feel like a South Park game. Even though the core of the game is built on a relatively solid gameplay foundation, everything surrounding Phone Destroyer feels pretty soulless. 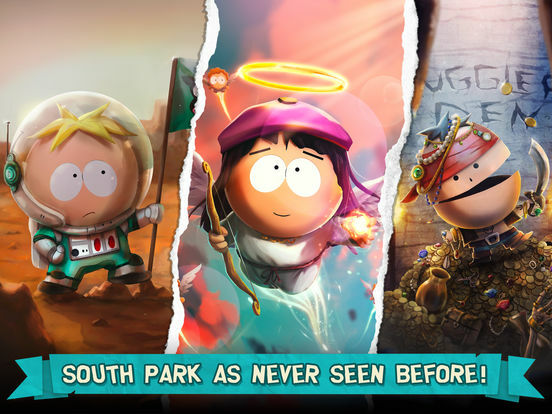 To imagine that South Park would let its soul be claimed by the Canadian Devil; it is a huge shame, as underneath all the nefarious schemes to all but force players into buying a ton of gold, to progress rests on extremely good and entertaining gaming. It kind of makes one wish they would release a retail version for full price without the freemium nonsense. This is a great game that unfortunately gets a bit overshadowed by the perceived double-standards of its business model and its overly complex system of upgrades, special packs, currencies, and items. Nevertheless, if you're a fan of South Park you should give it a try just because it offers great production values, plenty of fan service, and Randy moments (Sixth Element Randy is worth a google). Fans of the show will enjoy the characters and humour, but everything else Phone Destroyer has to offer is done better elsewhere. 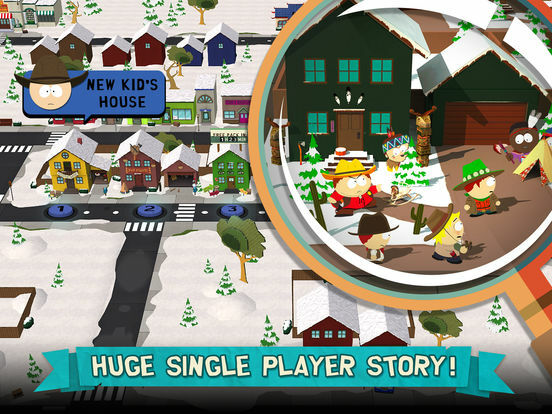 South Park: Phone Destroyer es la demostración de que con buen hacer, incluso en un teléfono móvil es posible reflejar todo el ambiente de South Park. Con una mecánica adapatada a dispositivos portátiles, el juego nos ofrece horas y horas de desafíos, partidas contra otros jugadores y mucho sentido del humor. 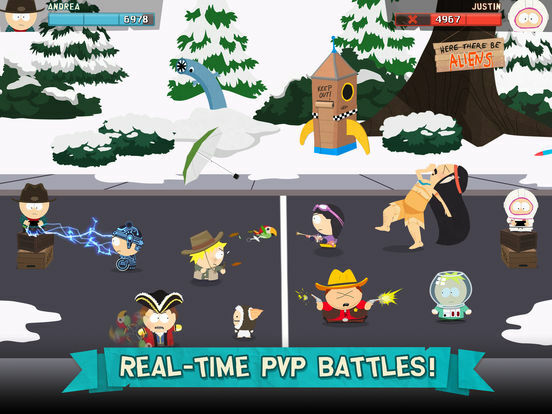 En cualquier caso, South Park: Phone Destroyer es un videojuego recomendable, que sabe reírse de él mismo cuando toca, y que tiene muchísimos aciertos. A poco que se sea un gran aficionado a la serie de televisión, merecerá mucho la pena su descarga. South Park : Phone Destroyer est un élève plutôt appliqué qui récite avec une certaine rigueur les règles instaurées par les jeux mobiles façon Clash Royale. South Park: Phone Destroyer è un clone di Clash Royale tutto sommato ben realizzato nell'aspetto e nel fanservice, ma piacerà soltanto agli appassionati della serie. 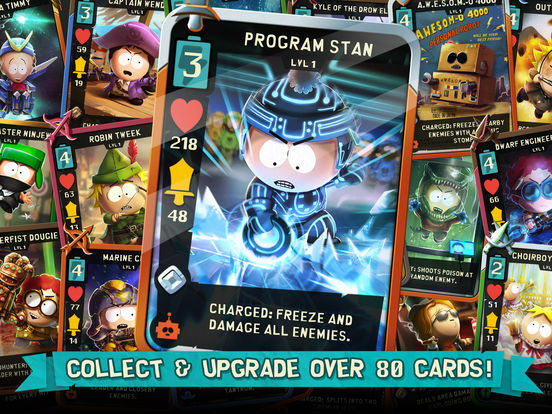 Toch is South Park Phone Destroyer een sterke titel als je van collective card games houdt en bekend bent met de personages uit de tv-serie. De onderbroekenhumor is er een op een van overgenomen en heeft daardoor dezelfde charme als South Park The Fractured But Whole. Nu blijft Phone Destroyer natuurlijk een mobieletelefoongame en daarmee een stuk kleiner.